Home Ground - Fitzroy Oval, Coffs St, Coffs Harbour. Training will commence for 2019 on Thursday 28th February 4.00pm to 5.30 with a Come and Try / Registration Day. Join us for some fun AFL activities and enjoy a sausage sizzle and Pizza after the session. Bring a friend and the family as well! The club will have teams in Auskick (Boys and Girls born 2010 or later), Under 11's (boys and girls born in 2008 and 2009), Under 13's (boys and girls born in 2006 or 2007), Under 15's (boys born 2004 or 2005) and Youth Girls (girls born 2002 to 2005). To register for the 2019 season follow the links on the right hand side of this page . 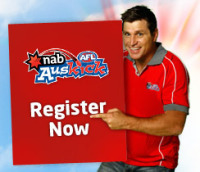 Auskick Registrations $125 (includes Auskick pack), Junior Registrations $135. Active Kids Vouchers can be used towards registration. Just have your voucher ready during the online registration process. Season begins Sunday 7th April 2019 and will run until the end of August.